3) to prevent food from sticking to the cooking surface. 1. Preheat oven to 275 degrees Fahrenheit or higher. The main point of seasoning is to bake the oil into the pores of the pan. 2. While it is preheating, wipe a generous amount of oil or grease around the edges and bottom of the pan. Wipe away any extreme excess. Place the skillet in the oven for 2 hours. 3. To get a strong coating, repeat the process. If food starts sticking to the skillet, it is time to reseason. 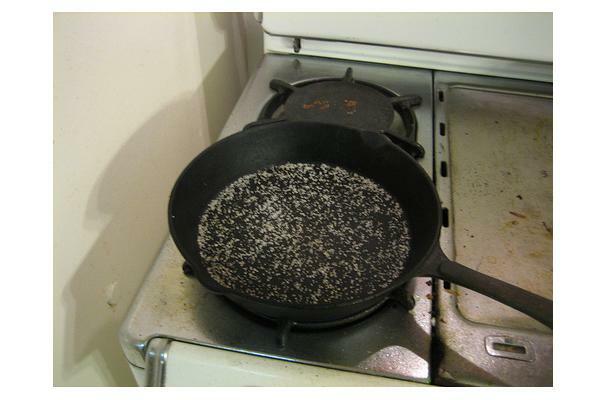 After cooking, do not wash your pan with soap or an abrasive pad. This will remove the seasoning. To clean, sprinkle kosher salt in the pan and rub with a paper towel until clean. Do use an scratchy pad to remove rust, but you must reseason after doing so. I have found that cast iron seasons best with fat, not oil. If one seasons with oil, the oil produces a sticky surface. I like to season with bacon fat. I would season with a much, much higher heat. I look up the smoke point for the oil I am using and preheat the oven to a few degrees above that. This allows you to season much quicker, the process is done the instant the oil begins to break down and smoke. The burned in oil will not leave a sticky residue, and will last longer than oil that is not quite burnt.